Luna was one of my best friends. She was 11 when she died. That's young for a Chihuahua, well middle aged really. Even though she was a little 6 pound dog she had the ability to fill a room with her outsized personality. She had a hilarious ability to be bossy and in charge letting me know when it was time for dinner or when she wanted to go outside. She was a very clear communicator. To the other animals in the house she was a good friend and stabilizing force. Even now months later after she died Cash (our cat) and Rosie (our other dog) are still trying to come to a balance in their relationship. Luna was able to keep everyone in check. Also most importantly she was the greatest snuggler in the world. The best. I miss my warm stinky little friend. 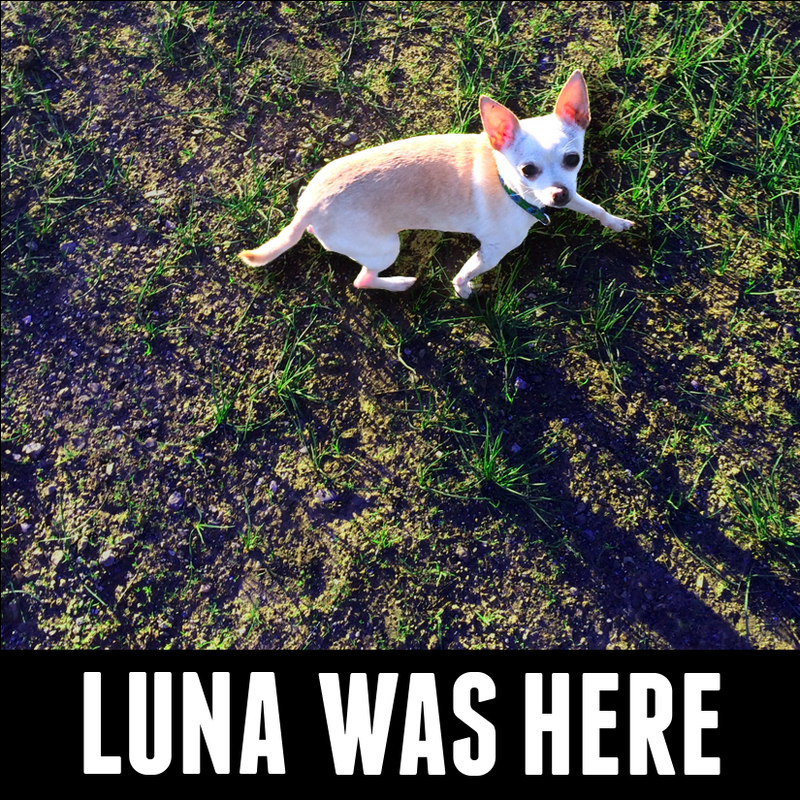 "Luna Was Here" is a project that had it's genesis in a dream. A month or so before she died of cancer I had a dream where I put up stickers with her picture on it all over the world to memorialize her and remind everyone that she had been here. I sat with this for awhile. It was in my mind but actually starting the project felt like an admission that she was going to die. I wasn't ready for that yet. Finally on Tuesday April 24th, 2018 Luna's beautiful little body gave out. I announced on social media that she had finally died. Here's what I wrote on Instagram that day and the kind words friends posted as a response to her death. This is a picture of the last morning of my dear friend Stella Luna, who we called Luna. She had been battling mast cell cancer since August. It was the second time she was stricken with this disease but this time it was the worst form you can get. We tried just about everything to help her: surgeries, chemo therapies, raw diet, home cooked ketogenic food, herbs, prescription meds, oils, CBD elixirs, plant enzymes- everything within reason. Sadly over the weekend her beautiful little body finally really began to give out. And so with great sadness we decided intercede and end what was surely going to be a period of extreme discomfort for her with no possibility of recovery. We know that this is part of the deal when we decide to let these little furry friends into our lives and become full fledged family members. I have no doubt that many of you have had to go through this yourselves with your little (or big) friends. I want to thank all the friends that have helped in her care. There were a myriad of great doctors who also must be thanked. Despite their wisdom and efforts there was nothing to be done to fight this aggressive awful disease. dianmitchI’m so sorry Eric. I never met Luna but I felt like I knew her from all of your posts. ❤️. ozterizerSo sad to hear of this but what a wonderful remembrance of a beautiful little pup. Rest in peace, Luna. hanskellnerI’m sorry Eric. So very painful. Thanks for being a great caretaker to Luna. And for posting your memories. They resonate. I’ll miss her. jlpierce0A truly beautiful and heartfelt celebration for your loved one. So sorry. sukibakerEric, I'm so sorry! 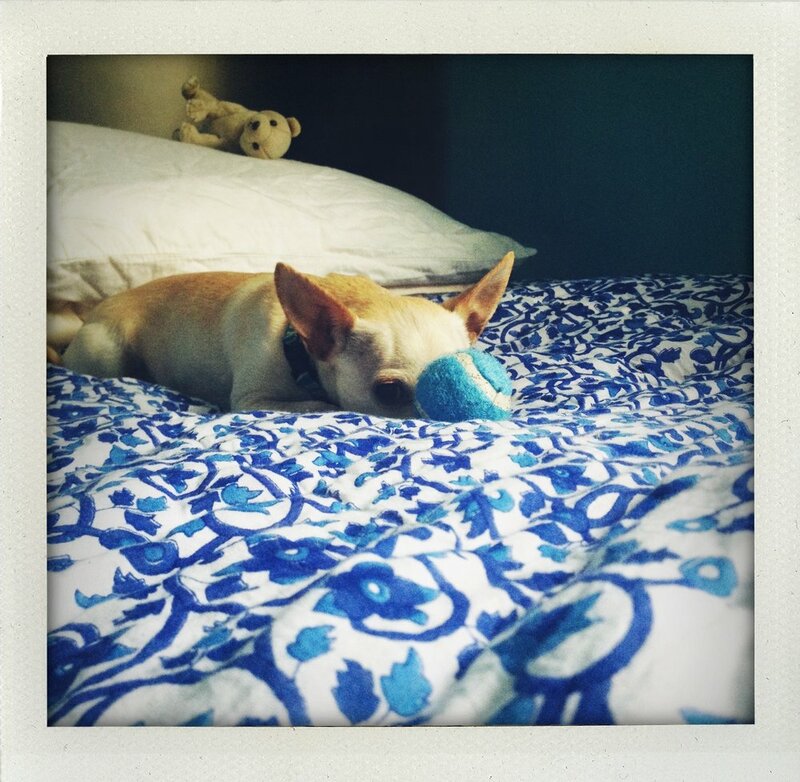 Beautiful eulogy for your beloved little buddy. So much joy with these little ones but such sadness when they pass through. Thinking of you! halloweenteeth💔💔💔 Goodbye sweet Luna. You were so wonderful. king_gidoraThe Luna will be in the sky every night. thewanderer415No words can fill the void my friend. Just know what a gift you were both given to have found it such other. The response has been great and immediate. In a week I got so many requests for stickers that I quickly ran out of the first batch. The day after I posted on Instagram I got a text from my good friend Edona. Her son Ezra had a friend who was going to France the next day and would happily put up a Luna sticker in Paris. Two days later I got a text from Edona it had this picture of one of Luna's stickers put up on a pole in front of the Notre Dame Cathedral in Paris. I immediately began to cry tears of joy and sadness because I miss my little friend so much. I haven't met the young man who put it up, Eli Bamburger, but I will always be grateful that he did that for me. If you're in Paris you can see the first Luna sticker put up. It's in front of the Notre Dame Cathedral! I've already received numerous pictures of the sticker out in the wild and I've put up a bunch myself. In the coming days I will be posting more of these images. I'm making this webpage myself. I have to admit my skills are lacking and I haven't quite figured out the best way in which to display this project but I'm slogging through the best I can. It's part of the process, Right? Okay- If you have some stickers and you haven't put them up yet and sent me a picture of them in the wild it's a great time to do it!. It can be a bit nerve racking to actually do it but it's really sort of fun. If you are nervous about doing it you can alleviate some of that stress by looking and seeing where other people have put up stickers. Those are generally great places to put them. If you see stickers up somewhere it means a couple of things: people put up stickers there! And stickers stay up there. Feel free to contact me if you have any questions. Also I am thinking of how I might incentivize you fine folks to actually put them up. I have several ideas that I think might be fun tokens of my appreciation. If you want some stickers hit me up and I'd be happy to send them to you. The offer is good while supplies last. I am happy to announce the Croix de Luna! The CDL is a button that is awarded as a thank you and acknowledgement of the bravery for those of you who have deployed a Luna Was Here sticker out in the wild. THANK YOU!